Fancy keeping a few hens in your garden? Well have we got a deal for you! Buy any Eglu Classic or Eglu Go and we’ll treat you to a free Funshade and free delivery! That’s on top of all the eggstras you usually get with an Eglu, so you’ll receive a Summer Shade as well as as the bright and colourful Funshade of your choice. Perfect for brightening up the garden! This offer is also applicable on Eglus for rabbits, so if you’d prefer a couple of bunnies hopping around this Easter then this is a great deal for you too! To get your freebies just add your Eglu and Funshade of your choice to your basket and use this code: FUNSHADE2011. If you’d prefer a free Winter Shade instead use the code: EGLUBONUS. 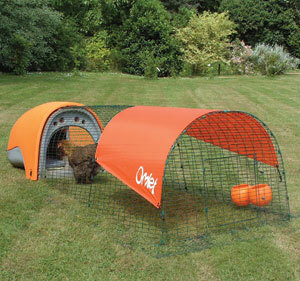 Free Funshade and Free Delivery with Every Eglu Go and Classic!